With a clear requirement for quality bottling services in the Clare Valley region Bottling Dynamics was founded. Established in 2006 by Ben Jeanneret an efficient bottling service was first commissioned to cater to the needs of local wine producers. With increased demand for services, the decision was made to develop a new site in 2008. With ideal logistical positioning for transportation services and over 2500 square metres of floor space secured, the business was relocated in May of 2009. This location remains the current home of Bottling Dynamics just outside of Auburn South Australia. This development was further enhanced by the inclusion of a high quality independent laboratory service that enables a complete solution to many of the region’s wineries. Delivering harvest, fermentation, bottling, and maturation analysis it provides a specialised service to many of the winery requirements that may not be part of their core business. 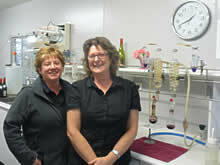 Bottling Dynamics has remained a leader in small run bottling and instrumental analysis in the Clare Valley region. Customers further benefit from warehousing solutions that provide storage of their valuable wines in a temperature controlled environment. With the contract bottling, laboratory analysis, warehousing and freight management all being performed under the same roof, Bottling Dynamics employs ten local people and continues to go from strength to strength.